As a flute and soprano duo, Dalia Chin (flute) and Nina Dante (soprano) are dedicated to performing works that explore the limits of their instruments, as well as the deep emotional catharsis that music can offer. Since 2012, Chin and Dante have collaborated to present avant garde new works by explorative composers from all over the world. They are both founding members of the contemporary music ensemble Fonema Consort. Dante and Chin gave the world premiere of Stratis Minakakis’ Cassandra Fragments at New England Conservatory in February 2019, along with performances of solo works by Minakakis. They have performed as a duo at the University of Wisconsin-Whitewater and Saint Xavier University. With Fonema Consort, Chin and Dante have held residencies at Harvard University, Oberlin Conservatory, Northwestern University, the University of Chicago, Scripps College, and UNAM (Mexico City). Performances abroad have included appearances with Visiones Sonoras (Morelia, MX), International Festival of Chihuahua, the Universidad de Costa Rica, El Museo Universitario de Arte Contemporaneo, and Teatro Sucre (Quito, Ecuador). Over the past six years, they have commissioned and performed works by composers including visionaries Julio Estrada and James Dillon; as well as over 40 rising-star composers. They can be heard on the albums Pasos en otra calle (New Focus Recordings), FIFTH TABLEAU(Parlour Tapes+), and Three Burials (New Focus Recordings). 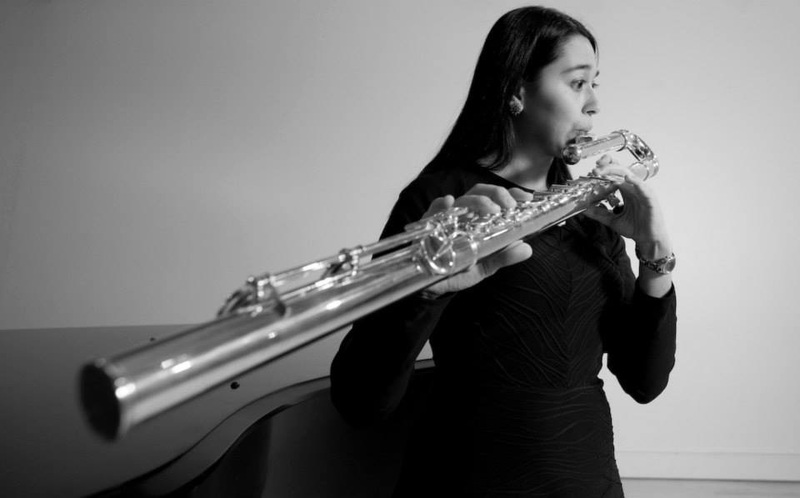 Chicago-based Costa Rican flutist Dalia Chin is a founding member of Fonema Consort and the Chicago Composers Orchestra, both of which are dedicated to performing music by living composers. She has been in residence and given performances at institutions including New England Conservatory, the University of Chicago, Northwestern University, Oberlin Conversarory, Harvard University, the Universidad de Costa Rica, Scripps College, UNAM (Mexico City), the University of Wisconsin-Whitewater, the 113 Composers Collective and North Central College. She has performed in festival and at venues including Visiones Sonoras (Morela), the Florida Flute Convention, Festival Interfaz (Monterrey), Omaha Under the Radar, the Ear Taxi Festival, the Festival Internacional de Chihuahua, the Museo Universitario de Arte Contemporaneo ( Mexico City), the Teatro Sucre (Quito), the City of Chicago’s Pritzker Pavilion, and National Sawdust. She has performed Pablo Chin’s flute concerto Inside the Shell with the Chicago Composers Orchestra, the Costa Rica Orquesta Sinfónica de Heredia, and the University of Wisconsin Whitewater Orchestra. She is the featured soloist on the recently released album Three Burials (New Focus Recordings) which compiles the flute works of composer Pablo Chin. She can also be heard on Fonema Consort’s albums Pasos en otra calle (New Focus Recordings) and FIFTH TABLEAU (Parlour Tapes+). Dalia works in close collaboration with composers as a soloist, with Fonema Consort and with the Chicago Composer’s Orchestra. Recent commissions and premieres include works by Stratis Minakakis, Pablo Chin, Fernanda Aoki Navarro, Francisco Castillo Trigueros, Bethany Younge, Julio Estrada, Monte Weber, and Tiffany Skidmore. Dalia earned Post-Masters degree from DePaul University, her Masters in Music Performance at Florida State University, and her Bachelors Degree in Music Performance at the University of Costa Rica. Dalia is currently the program director for the Chicago Metamorphosis Orchestra Program, Director for the New Horizons Flute Choir at the Depaul Community Division. She has a private, Suzuki-certified studio in Chicago. Soprano vocalist Nina Dante is a soloist, chamber musician, improviser and composer based in New York City. Musical experimentation and the continual discovery of the voice’s technical ability and emotive power are the inspiring forces behind her work. Dante is co-founder, manager and soprano of the avant garde chamber ensemble Fonema Consort. Her recordings with Fonema can be found on New Focus Recordings (Pasos en otra calle) and Parlour Tapes+ (FIFTH TABLEAU). Please click here to contact Nina Dante with booking inquiries.